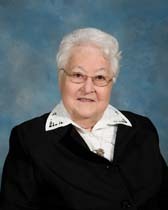 Sister Leona Tucker died at Saint Joseph Villa on December 2, 2018, and was buried on December 7, 2018. For 77 of her 95 years, S. Leona was a Sister of Saint Joseph. This strong sister was one of the 11 surviving siblings from a family of 13. She grew up in Pen Argyl, a small town at the foot of the Pocono mountains. Sister admitted that Catholicism was not a favorite religion of this small town. Since there was no Catholic school in the town, Leona first learned about sisters through the magazines to which her mother subscribed. As a teenager, she loved being in their little parish church, and she realized later that these were the beginning of a strong and faithful relationship with her God. In 1941, she entered the community and as Sister Elizabeth Leona, she began her life as a first grade teacher. She fulfilled this role for 12 years. This portion of her life was the remote preparation for her 41 years of serving those with developmental disabilities. Through her own struggles of teaching special children, Sister Leona came to appreciate her call to serve some of the most vulnerable among us. After 20 years of teaching, Leona was asked to take on the challenge of being chaplain at Woodhaven Center. She took great pride in being the first Catholic Religious Woman named Chaplain in Pennsylvania. Leona was stretched , working in a multi-faith environment, and she willingly embraced the negative attitudes of many critical of what she was trying to build. In addition to her direct service through sacramental preparation, Leona also made opportunities to educate others, including the congregational leadership and church hierarchy, to the needs of the special population whom she loved so dearly. Leona appreciated the shift as persons with developmental disabilities gradually were integrated into the broader community, even though it resulted in her leaving her position. She became a part of the change as she ministered at Catholic Social Services in the newly formed Family Living Program where again she displayed her creativity, flexibility, and compassion. Leona’s loving spirit was manifested in her devotion to her large family. She grieved the loss of so many siblings- William, Velma, Ruth, George, Martin, Margaret, Bernard, Mary, Virginia, and John. Likewise, her love for her sister Faith and her many nieces and nephews defined Leona as both a familial and a community sister. In her 77 years as a Sister of Saint Joseph, she experienced and embraced many changes in the various aspects of her life. She was happy in many local communities and at the Villa. Her ability to form deep and lasting relationships was life giving to her and to those around her. Sister Leona described herself as a pioneer. She wrote, “I was the first and only girl from my parish to enter the Sisters of Saint Joseph; one of the first to study Special Education; and one of the first, if not the first, to leave the classroom, the first Catholic Woman Religious Chaplain in Pennsylvania, and the first supervisor of the Family Living Program.” Truly, Leona was “ready for any good work.” Leona died on the first Sunday of Advent, but her waiting time has ended. Enjoy your new life, Pioneer Leona. It is well deserved.